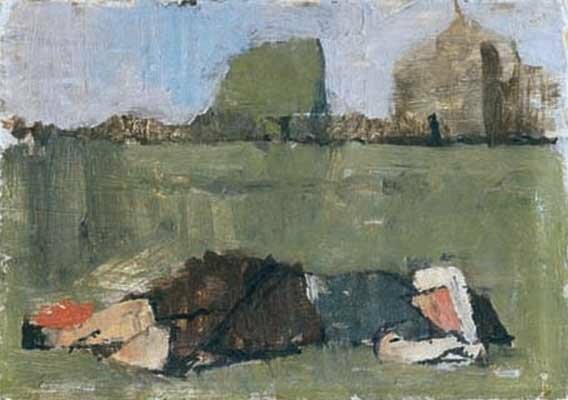 Painted when he was only nineteen, shortly after he had become a student at the Slade, this quiet little oil study bears all the early signs of precise analysis and measured mark-making that were later, in the 1960s and 1970s, to characterise Uglow’s mature style and make him such a respected figure within British figurative painting of the time. It was an approach to painting that he had first evolved at Camberwell in the late 1940s, under the particular influence of William Coldstream and Claude Rogers. Ten years or so before they had been among the key figures in developing the realist painting of the Euston Road School and, though it was Coldstream whose mantle Uglow was later regarded as adopting at the Slade, here it is Claude Rogers’ more sensuous feeling for form and softer touch that play a more significant part, as we observe Uglow just starting to find his own voice.